MediaCityUK is part of The Peel Group - a leading infrastructure, transport and real estate investment company in the UK. 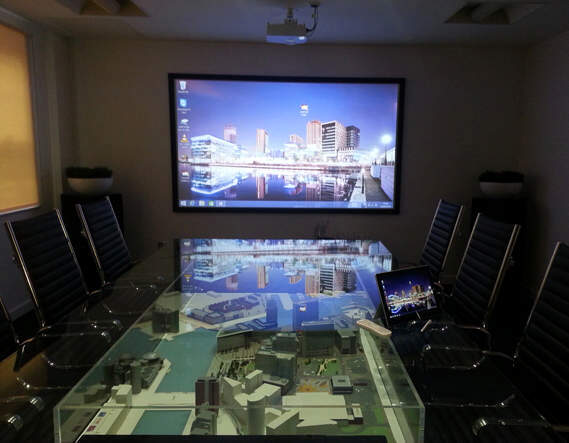 Challenge: Peel Media Limited, owners of MediaCityUK, wanted to equip its meeting room with the latest technology to be able to wirelessly present high definition imagery close to the screen with no shadows. Solution: The bright EH200ST was chosen for the installation due to its HD 1080p resolution, its short throw lens and low price. It creates the pin-sharp detail needed for maps and plans. Results: Property managers have the freedom to walk close to the screen without obscuring the image with shadows. They can wirelessly present MediaCityUK’s HD marketing video from the Surface Pro and access a Powerpoint presentation or any other office document stored on the network. Located on the banks of Manchester's historic Ship Canal, MediaCityUK is a new waterfront destination with digital creativity, learning and leisure at its heart. Its vision is to become a leading international hub for the creative and digital sectors. It comprises an eclectic mix of more than 200 businesses including the BBC, ITV, Coronation Street, SIS, The University of Salford and Bupa. Major educational and training providers are already in MediaCityUK, complemented by a mix of restaurants and bars, and retail therapy in the Lowry Outlet. The scheme also features a wide range of commercial office space, one of the biggest HD studio developments in Europe - dock 10, a Holiday Inn hotel and great transport links via tram or nearby motorway network. Peel Media Limited, owners of MediaCityUK - Manchester’s creative and technological hub located on the banks of the Manchester Ship Canal, wanted to equip its meeting room with the latest technology to showcase its properties to prospective tenants. It needed to give its property managers and Managing Director the freedom to roam the room wirelessly while presenting high definition images, videos, maps of the area and Powerpoint presentations. It was important, they could point out details on plans and present close to the screen without casting shadows. The bright EH200ST was chosen for the installation due to its HD 1080p resolution, its short throw lens and low price. 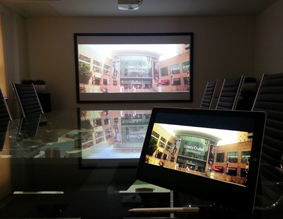 Short throw projectors are ideal for rooms where there are space constraints but where a large image is required. These include classrooms, meeting rooms and training venues where the presenter is at the front and wants to avoid creating shadows. The EH200ST allows the team to wirelessly present its HD marketing video of MediaCityUK from the Surface Pro and go straight onto a Powerpoint presentation or any other office document stored on the network. It creates a bright crystal clear picture giving the pin-sharp detail needed for maps and plans. Property managers have the freedom to walk close to the screen without obscuring the image with shadows. The EH200ST can project a super-sized 100-inch picture on a screen or wall from just over a metre away. The full 3D 1080p projector, with a powerful 10W built-in speaker, produces bright vivid colours due to its 3,000 ANSI lumen brightness. It has two HDMI inputs and can be turned into a smart display by connecting a smartphone or tablet with a single cable using MHL to play games, stream videos and share images on the big screen.